PE0270. 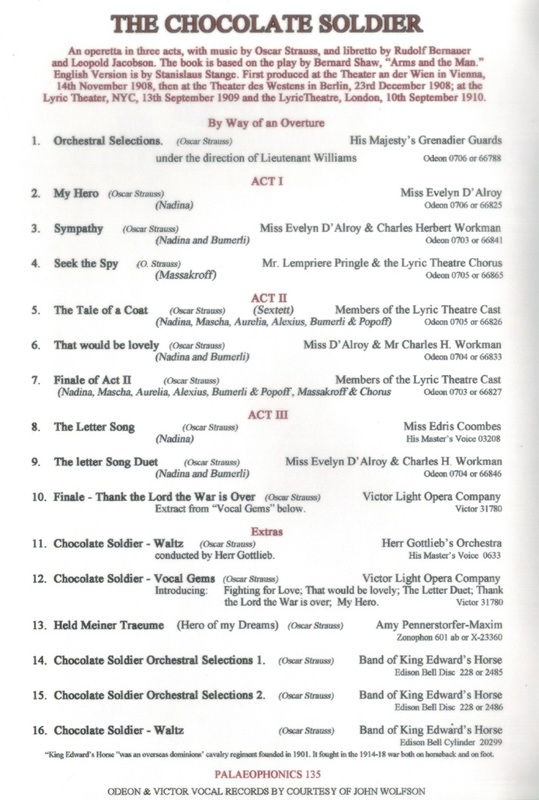 THE CHOCOLATE SOLDIER (Oscar Straus), recorded 1911, w.Lempriere Pringle, Evelyn D'Alroy, Charles H. Workman, Edris Coombes, Amy Pennerstorfer-Maxim, Victor Light Opera Company, Band of King Edward's Horse & Herr Gottlieb's Orchestra. (England) Palaeophonics 135, w.Elaborate ‘The Play’ 28pp. Brochure replete with numerous photos of the London Lyric Theatre 1910 production & biographies. Excellently transferred from the legendary Acoustic 78rpm Odeon, Gramophone Company & Victor rarities. “THE CHOCOLATE SOLDIER (German title: DER TAPFERE SOLDAT) is an operetta composed in 1908 by Oscar Straus based on George Bernard Shaw's 1894 play, ARMS AND THE MAN. It premiered on 14 November 1908 at the Theater an der Wien. English versions were successful on Broadway and in London, beginning in 1909. The first film adaptation was in 1915. When Shaw gave Leopold Jacobson the rights to adapt the play, he provided three conditions: none of Shaw's dialogue, nor any of the character's names, could be used; the libretto must be advertised as a parody; and Shaw would accept no monetary compensation. In spite of this, Shaw's original plot, and with it the central message of the play, remain more or less untouched. The main love aria, for instance, is sung by the heroine just before she meets the ‘other man’, and the ‘brave’ soldier turns out to be a worse coward than his unmilitaristic rival. Shaw despised the result, however, calling it ‘a putrid opera bouffe in the worst taste of 1860’, but grew to regret not accepting payment when, despite his opinion of the work, it became an international success. 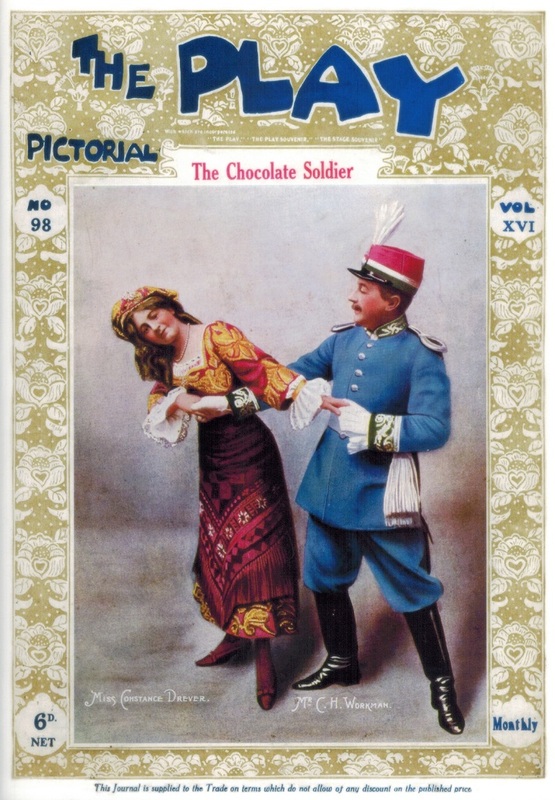 When Shaw heard, in 1921, that Franz Lehár wanted to set his play PYGMALION to music, he sent word to Vienna that Lehár be instructed that he could not touch PYGMALION without infringing Shaw's copyright and that Shaw had ‘no intention of allowing the history of THE CHOCOLATE SOLDIER to be repeated’. PYGMALION was eventually adapted by Lerner and Loewe as MY FAIR LADY, made possible because they were, at least in theory, adapting a screenplay co-authored by Shaw, with rights controlled by the film company. “A newcomer to the stage, Charles H. Workman joined the D'Oyly Carte Opera Company in 1894 as Calynx in a provincial tour of UTOPIA, LIMITED. In 1895, he also played the roles of Pedrillo in THE CHIEFTAIN, Mr. Bunthorne's Solicitor in PATIENCE and Pennyfather in AFTER ALL!, the curtain raiser for a revival of THE MIKADO. Workman then created the small part of Ben Hashbaz in THE GRAND DUKE (1896). He later created the part of Adam in F. C. Burnand and R. C. Lehmann's HIS MAJESTY (1897; appearing briefly as King Ferdinand when George Grossmith abandoned the part, until Henry Lytton took over). Workman was Simon in OLD SARAH, the companion piece for the first revival of THE YEOMEN OF THE GUARD (1897). In THE GRAND DUCHESS OF GEROLSTEIN that year, he also played Carl. Beginning in 1897, Workman was promoted to principal comedian of the main repertory touring company, appearing as the Lord Chancellor in IOLANTHE, Ko-Ko in THE MIKADO, and Jack Point in YEOMEN. He returned to the Savoy Theatre in 1906 and played the principal comedian roles created by George Grossmith for the company's repertory seasons there and on tour with the company, until 1909. Workman then left the D'Oyly Carte organisation and became an actor-manager. He leased the Savoy and produced two comic operas: Eden & Somerville's THE MOUNTAINEERS (1909), appearing as Pierre, and W. S. Gilbert and Edward German's FALLEN FAIRIES (1909), appearing as Lutin. He then produced an Edwardian musical comedy, TWO MERRY MONARCHS (1910), appearing as Rolandyl, and an opera, Gluck's ORFEO, (1910).